This evergreen perennial from the southern Cape of South Africa forms dense clumps of round, dark green stems. The leaf joints are covered by dark brown sheaths which fall off in summer leaving an attractive dark band. Late in the season the stems arch gracefully from the weight of clusters of small brown flowers at the tips. Plant in full to partial sun. Once established, Cape rush is drought tolerant. On the central to northern California coast, it looks good year round without any summer water. In warmer areas, it benefits from occasional supplemental water when the soil's starting to become dry. 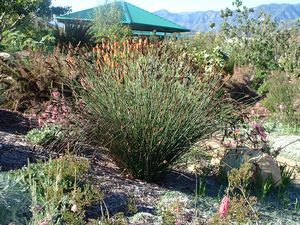 Like some of the California native rushes such as Juncus patens, Juncus effusus and Juncus textilis, cape rush is both drought and water tolerant and can also be used as a marginal plant in a water garden. Cape rush tolerates a wide range of soil types including clay, sand, alkaline and acidic. It is hardy to about 20°F. Cape rush started to become popular in the US in the late 1990s/early 2000s. There was some initial confusion over its true identity and the plant initially distributed by the nursery trade as Chondropetalum tectorum was subsequently reclassified as Chondropetalum elephantinum. The taxonomic work on this was done by Dr. Hans Peter Linder, a professor at Switzerland's University of Zurich Institute for Systematical Botany and co-author of the "Restios of the Fynbos." San Marcos Growers, an excellent wholesale nursery in Santa Barbara CA, received the first offering of the true Chondropetalum tectorum seed in the spring of 2004. Plants sold by Gold Rush Nursery originate from plants we bought from San Marcos Growers in 2005. Cape rush should need very little maintenance, if any. If the plant becomes too wide, you can reduce the width by cutting back some of the stems at ground level. If the plant becomes too tall, we strongly recommend that you don't reduce the height by shortening the stems. The plant will look ugly really quickly if you do this! If you really don't like the height, dig the plant up and transplant it to a more appropriate spot or give it to a friend!